COLUMBIA, S.C. (AP) — When Terry Bowden was coaching Auburn he saw just what he needed in graduate assistant Will Muschamp 23 years ago. So it’s no surprise to when that Muschamp has excelled running a program. Brown’s Akron Zips (4-7) face Muschamp’s Gamecocks (6-5) to close the regular season in a makeup game after South Carolina’s contest with Marshall on Sept. 15 was canceled due to Hurricane Florence. Akron saw its season-opener at Nebraska called off because of lightning and strong storms. When Muschamp’s time as a graduate assistant was over, he took a position outside of football. But that didn’t stick for long with Bowden’s encouraging words that Muschamp could be a successful teacher, mentor and football coach. Muschamp has the Gamecocks on a positive track . He’s the first South Carolina coach to start with three consecutive bowl appearances. And Muschamp’s aiming higher, telling his team to treat this extra week of game practice as a rehearsal for next year in preparing for a Southeastern Conference title game. 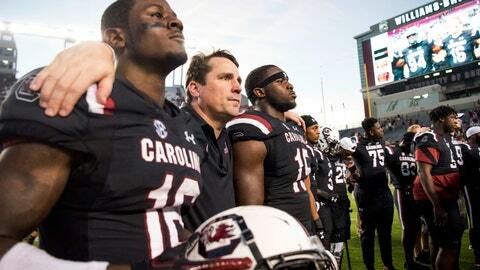 “The guys will tell you, I like to be able to practice things,” Muschamp said. South Carolina quarterback Jake Bentley is on a major roll. He had career highs of 510 yards passing and five touchdowns in last week’s 56-35 loss at No. 2 Clemson. Over his past four games, Bentley has thrown for 1,451 yards and 13 TDs and just two interceptions. The junior was on NFL scouts radar when the year began. His recent play has revived talk of turning pro after this year. Bentley and coach Will Muschamp say the focus is solely on Akron. Even though it’s his second game as a head coach at South Carolina, Akron’s Terry Bowden will mark his first time on the sideline. The other occasion, as Auburn’s head coach in 1997, Bowden had to stay up in the coaching box due to a back injury. The eighth-ranked Tigers improved to 5-0 that year with a 23-6 win over the Gamecocks.